Demand is pushing your Seated half dime value higher. Collectors seeking these scarce coins are driving the price up. The minimum value is $11 to $14 each. Last minted in 1873 this classic Seated Liberty Design does have its share of rarities. Most dates in the mid 1860's are very elusive, and many of those minted in New Orleans identified by the "O" mintmark trade at a premium. Also, condition is important to value. The coin pictured is a very desirable "Uncirculated" Seated Half Dime, and because of its choice condition is worth over $115. 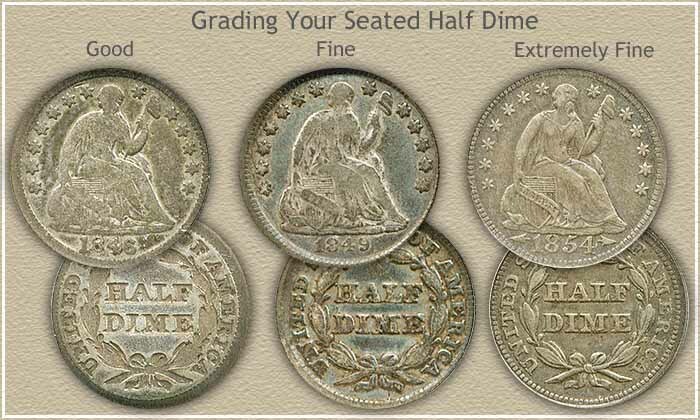 Date, mintmark, and condition all contribute to Seated half dime value. The following chart lists values of coins in four different "Grades", determined by judging the condition of the piece. It is clear dealers and collectors pay a premium for better grade coins. How to grade your half dimes is covered below. Above is the wholesale Seated Half Dime value. Computed from dealer's price lists with various mark-up factors figured in. They reflect closely the price you would expect to receive when selling. Variations in value do occur subject to subtle grading points, collector demands and dealer needs. If your coin is not listed above, it is seldom encountered. For additional reference... NumisMedia publishes an extensive fair market value price guide, covering retail Seated half dime value in detail. These small silver coins as they traveled through commerce began to wear and the design details faded. As a result dealers and collectors judge the different degrees of wear and each is assigned a "Grade". Examine your half dimes closely comparing them to the coins above, each represents a different grade and Seated half dime value. The highest part of the design, subject to early wear, runs through Liberty from her head to knee. The "Extremely Fine" grade shows some wear in these areas, however the appearance is sharp and crisp. Half dimes in "Fine" condition are still pleasing with moderate fading of the design. The heavily worn "Good" grade looks tired in appearance, showing Liberty smooth, lacking most detail, in outline form. In the higher grades, the value difference from one grade to the next is often large. If you feel your Seated half dime value is $100 or more because of grade, but are just not sure. Help is available. NGC and PCGS are the two largest coin grading services, collectors and dealers consider these the leaders in the industry. Seek their advice. They both authenticate and grade your coins. The small fee you pay provides assurance you understand and receive the full value of your coins. Check a few rare coin dealers listings, look for those offering Seated Liberty half dimes similar to yours. Their higher priced listings usually include a notation of the NGC or PCGS assigned grade. Additionally, these coin dealers are potential buyers of your coins. Rare mintmark and date combination are found throughout the series. The two branch mints, San Francisco used an "S" mintmark and New Orleans an "O", both are scarcer than the Philadelphia Mint which did not use a mintmark. 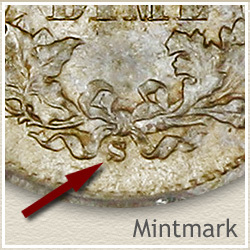 The mintmarks an "S" or "O" are located on the reverse, either above or below the wreath. Historically your Seated half dime value increase yearly. 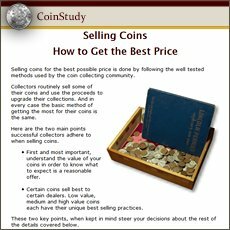 Coin Values Discovery... finds Seated Half Dime Value and... All old US coin values. It is an excellent index with images and text links to all coin series, from Cents to Gold. Value charts, grading images and descriptions uncover how much your box of old coins is worth. Consider your group of coins as the beginning of a Seated half dime coin collection. The start of an enjoyable and rewarding hobby. If that is not for you, one successful approach is to sell all your coins and use some of the proceeds to buy one nice rare coin. Perhaps a well preserved Uncirculated half dime. The one you were hoping to find in the box. Pass the thrill of a rare coin on to your children.